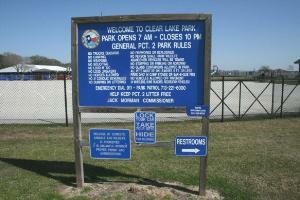 This is the sign to the park. Clear Lake Park is a very pretty park along Clear Lake. It has a playground for kids, covered picnic/bbq areas, gazebos, restrooms, pavillion, and a short trail that runs around and through the park. Since the park is along the water, there are numerous birds, including pelicans. You can watch the pelicans soar up and then dive straight down in the water in search of a meal. There are also a couple of piers that you can walk out on or fish from. This would be a nice park for family and friends to spend an afternoon at. Another advantage of this park is that it is on the Bay Area Hike & Bike Trail. You can read my log of that trail here.